Like Narcissus at the pond, we tend to look into the TV to see ourselves. At least that's what a new survey is saying about our reality TV watching habits, and while it can't tell you if people are hate-watching or just watching a show, we can see what the most popular shows in each state are. 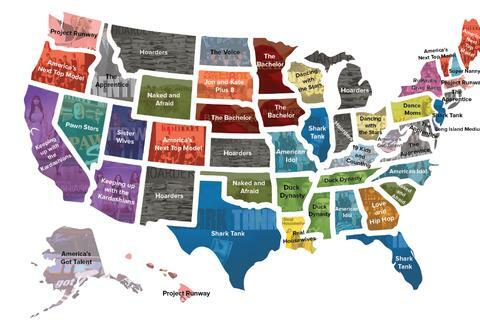 Using Google Trends, CableTV.com created a list of every state's three favorite reality TV shows (with the number one result represented in the map above). The results show states frequently preferring to watch the "reality" being broadcast about their region of the country rather than some other far flung part of the U.S.
For instance, Arkansas, Tennessee and Mississippi don't just love double letters in their names, they're big fans of the Louisiana-based Robertson family and Duck Dynasty. Meanwhile, Pawn Stars, shot in Las Vegas, is the favorite escape for the residents of Nevada and Sister Wives ranks at the top of the list in Utah. It's just one way of assessing a state's favorite show, but it's an interesting look into what regional preferences the country has, and maybe offers a little reassurance that we're not all that different. The Apprentice was in one of the top three slots in 20 different states. Hoarders came in second, listed in 14 states, followed by Dancing With the Stars (13), Shark Tank (12), Project Runway (11), and America's Next Top Model (10). Everyone loves to watch people get rejected and/or live in squalor. The shows at the bottom, getting love from just a single state each, were Vanderpump Rules (Hawaii), 19 Kids and Counting (Kentucky), Pawn Stars (Nevada), Mob Wives (New York), The Voice (North Dakota), Kate Plus 8 (South Dakota), The Biggest Loser (Utah), The Bachelorette (Utah), and So You Think You Can Dance (Utah). America, you truly are a melting pot. Except for when you're not, but that's great too. Dustin Nelson is a News Writer with Thrillist. He's seriously disappointed Iowa doesn't hold American Pickers in higher esteem. Follow him @dlukenelson.